One of the most common dental problems in adults is gum disease. The troubling part is that because it often develops so slowly and doesn’t have any obvious symptoms early on (pain), it may go on unnoticed until it gets serious. The immune system’s response to bacteria is what causes gum disease, but it may not be how you would think. Inflammation, which is a common symptom of periodontal disease, occurs when your immune system is trying to fight off harmful bacteria and are promoting the repair of damaged tissue. Stress also speeds up this process, because it weakens your immune system and allows bacteria to spread more quickly and easily. 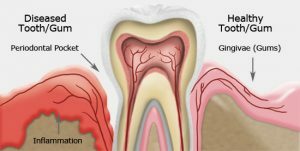 Specifically for Periodontal disease where “Peri” means around, and “odontal” means teeth, this is typically an infection in the parts around your teeth. These parts can include gums, ligament, or even bone. In early stages, bacteria in dental plague affects the gums and slowly develops towards your tissues in later, more severe stages. Smoking/Tobacco – Smokers are more prone to tartar building up on teeth. This increases the risk of periodontal disease, and more severe symptoms to occur. Treatment is also drastically more difficult for smokers. A good habit to have is to maintain a daily hygiene routine to thoroughly brush/floss your teeth. Consult your dentist for tips to ensure you are doing it right and personalizing it to your mouth structure. If you encounter any of these symptoms during your daily routines, make sure to contact your dentist right away for an opinion and checkup. They will be able to physically and visually evaluate your tissues and check to see whether or not your gums are showing any signs of disease. Bone structure can be evaluated through the use of X-ray. Gum diseases is one of the leading factors for why seniors lose their teeth. This is due to the gum wearing away and losing its ability to hold your teeth in place. After checking your condition with your dentist, you may be referred to a periodontist, a specialized dentist in the treatment of periodontal diseases. They typically have an additional 3-4 years of additional university education and training compared to a regular dentist, specifically in the field of treating and restoring bone and gum tissue lost from disease. 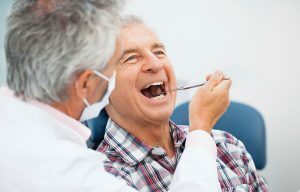 Surgical therapy – In more severe cases where non-surgical therapy is not sufficient, surgical techniques are required to repair and regenerate certain tissues and replace teeth. These typically include the use of anesthesia during the procedure.